Mayhue is the Senior Vice-President and Dean of the Master’s Seminary. This book has been around for a few years and parallels much of John MacArthur’s works on the Charismatics. The book is very readable (at only 150 pages) and can be recommended to friends who are struggling in this area. Many examples are used of unwise choices of Christians to follow faith healers who learn too late that such is not God’s plan for the sick. 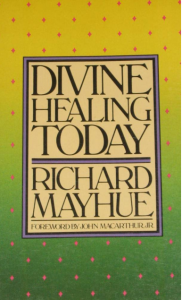 Mayhue has valuable discussions on the necessity of faith for healing, the cessation of miraculous gifts and the presence of miracles in many non-Christian religions. There is also a whole chapter on James 5:14-20.